This resource is still in preparation. Meantime since I understand that my book Practical Occupational Medicine is out of print. Please click here for an extract of the book relevant to this topic. Consider the image below, for example. 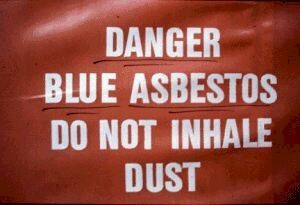 Would you consider that advising workers not to inhale blue asbestos is a reasonable way of protecting their health, and preventing ill-health? Incidentally - this sign was attached to the boilerhouse of a National Health Service hospital in Britain, and the photo was taken in the early1980's. With attitudes such as those illustrated by the photo, it is no surprise that hundreds of workers are sadly still dying every year from mesothelioma caused by occupational exposure to asbestos several years previously, and the number is set to continue rising, before it eventually falls.